The slow loris is now among the world’s top 25 most endangered primates. It is suspected that the population has suffered a decline of at least 80% over the last 24 years. These beautiful animals are taken from the wild to sell as pets at cruel animal markets in Indonesia. Their teeth are removed to stop them biting, leaving them in pain and susceptible to infection. Many perish at the market, or before they even reach it, and their body parts are used for traditional medicines. What’s more, their Javan forest homes are being destroyed, as pressure is put on the land. We are working with The Little Fireface Project to find out how to give slow lorises the very best chance when rescued and returned to the wild. The diminishing forests, bisected by roads and plundered for their natural resources, need protection if these primates are to survive. Armed with knowledge of the lorises’ needs, we can advise on what must be done to help and find the best possible areas to reintroduce them. A fundamental part of the work is education. People need to realise that slow lorises are not pets. Through events in local villages, a children’s book and campaigns to remove ‘cute’ slow loris videos from YouTube, it finally looks like all the effort is working. Information collected in Indonesia by an undercover researcher has shown the number of lorises on sale has already dramatically declined and in many cases there are none available at all. When asked, the traders say they don’t get them anymore because it is illegal. This is music to our ears and proof that we really can make a difference. The team have recently published a scientific paper on a very important topic – the use of Instagram to fuel illegal trade in slow loris photo props. This trade has made it very sadly to Europe, where tourists can have their photo taken with a slow loris in Turkey. We are working with TRAFFIC and other groups to curtail this trade. 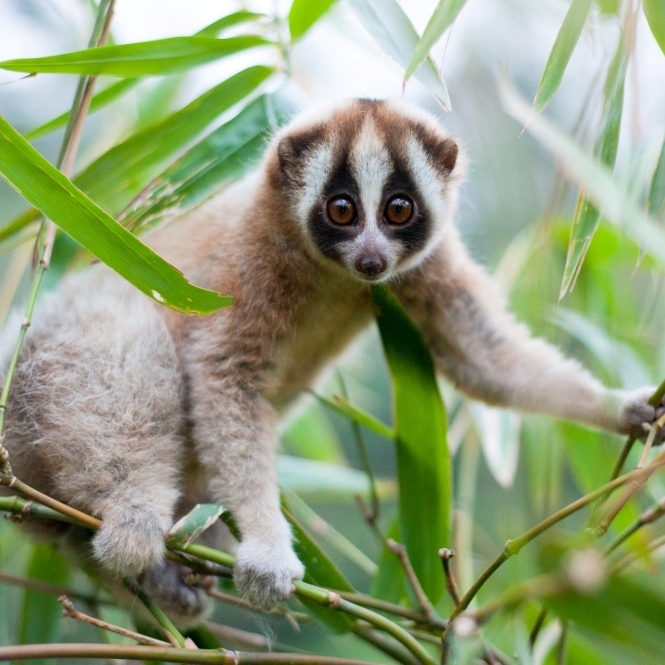 They have also been studying the development of young slow lorises. This is the first of a set of analyses of the births, lives and deaths of our slow lorises based on six years of study – it is very exciting to see patterns emerging. Possibly most exciting for the team in terms of life history, is they are now are observing ‘Lupak’ and ‘Tombol’- Lupak is the son of Lucu, who was our first female loris to disperse from home and find a mate, and have a baby (Lupak is actually number two for Lucu – we are still trying to collar daughter number one Lily!). Tombol is the son of Alomah who was the son of One Eye, our first male to move from home and have his own baby. We have our first two F2 lorises to observe and see the dynamics of three generations!